Solar System: Venus. Creation Testifies! For millennia people have enjoyed the sight of the "evening star" shining brightly in the western sky shortly after sunset. Venus is a small rocky world that shines only by reflected sunlight. 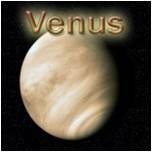 The composition of Venus is similar to Earth. Of all the planets, Venus' orbit is physically closest to Earth's orbit. Venus is sometimes referred to as "Earth's sister" or "Earth's twin." But there are far more differences than similarities. Venus is permanently enshrouded in thick clouds of sulphuric acid and toxic sulphur dioxide, masking all surface features. The atmosphere of Venus is comprised mainly of carbon dioxide and is the thickest atmosphere of the four terrestrial planets. The thick atmosphere on Venus acts like a blanket, trapping solar energy and warming the planet to unbelievable temperatures. At the surface, Venus has a crushing air pressure that is 92 times greater than Earth's air pressure. Because Venus orbits 26 million miles closer to the Sun than Earth does, Venus endures nearly twice the solar energy. The greenhouse effect causes the surface temperature of Venus to approach 900 degrees Fahrenheit! The hottest of any planet in our solar system. Venus has the most circular orbit of any planet in the solar system. Venus' axial tilt is only three degrees, so there are no seasons on this planet. Since Venus orbits closer to the Sun than Earth does, Venus orbits faster and completes a circuit every 7.4 months. A day on Venus is much longer than on Earth. Venus rotates once every eight months, so its day is actually longer than its year. On Venus, the Sun would rise in the west and set in the east. Venus rotates exactly opposite of what the evolutionary models require. But such diversity in expected in the biblical view. Since Venus rotates in the opposite direction, its solar day is reduced to 3.8 months. None of the other night time stars can compete with Venus. It is a fitting symbol of the beauty and glory of our Lord!